Make yourself at home in our luxury 3 bedroom 2 bathroom villa located in the lovely peacful area of Rotonda. During your stay you may experience viewing plenty of wildlife from the lanai and pool area we have spotted plenty of aligators,bob cats,armadillos,snakes and eagles. As you enter through the front door the layout is open plan with high vaulted ceilings and veiws of the pool and canal. We have a well eqipped kitchen with all the appliances you will need. Our master bedroom has a kingsize bed, 39 inch tv with views of the pool and canal, ajoining the bedroom is an en-suite bathroom with large walk-in shower,bathtub and 2 vanity sinks. From the en-suite we have a walk in wardrobe. Our 2nd bedroom has a quuen size bed, tv and wardrobe space. The 3rd bedroom has 2 twin beds,tv and wardrobe space. The large double garage is equipped with pool toys and trips to the beach with chairs ,cool box etc. The living area had a 50inch tv dvd player and free wifi throughout the villa. You can enjoy eating breakfast in the nook overlooking the canal or out on the lanai by the pool. The pool can be heated electrically for an extra charge. Awesome location in Rotonda West Florida. We enjoyed our stay here in Paul's luxury well equipped home, the pool, the canal view and watching birds, alligators and turtles. Also perfect for a day trip to Tampa or Orlando. Very nice beaches nearby like Englewood, Boca Grande ... Our recommendation for your stay: Just cruise around the neighborhood, visit places like Fishermen's Village in Punta Gorda and one of the long beaches for a sun downer. Our special tip: Air boat tour with Seminole Wind Airboat Tours on the Peace River. Very good property. We stayed as a family of 6 for 11 days and found the house to be roomy and comfortable and very well equipped. Lovely tranquil setting beside canal and an abundance of wildlife to watch including birds, alligators, turtles etc. 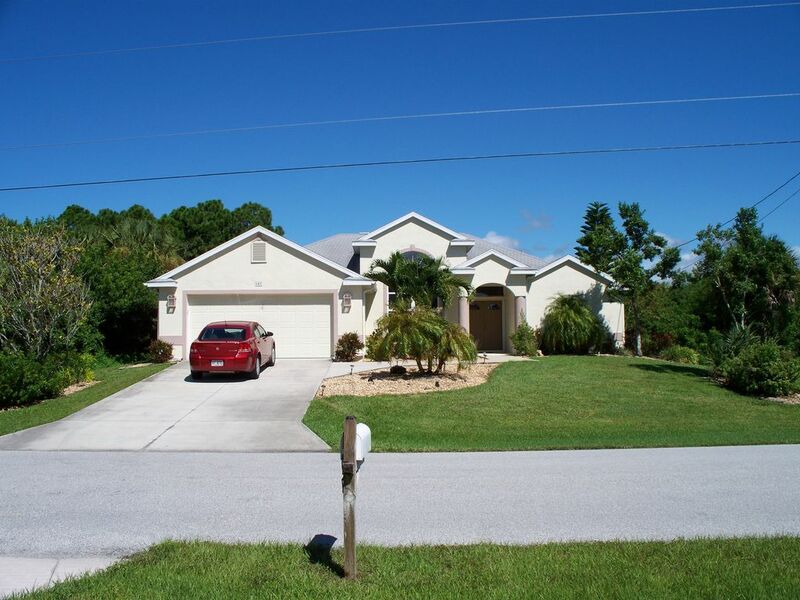 We have stayed on Rotonda many times before and like the laid back feel of the place, this is a very typical Florida style home which was perfect for our needs. Paul and the local agent were very helpful and easy to deal with. We had a truly wonderful stay in this villa. Paul was accommodating and very helpful during our stay. We particularly enjoyed the billiard table, pool, access to bikes and the overall feel of this paradise home. We are definitely planning on coming back in the future. We had a wonderful 8 night Stay, the location right on the waterway is lovely and there’s plenty of wildlife to see. The villa is well equipped and clean. nice house for 2 ! good house but not for 6 people ! The master bed should be replaced as soft and the windows could do with a clean . Everything is there for cooking and its a lovely view to the river .! pool table,bikes and plenty of beach and pool stuff to use which was great ! The house is a 3 bed 2 bath home and is set up to accommodate 6 people. With mattresses it is hard to please everyone as some people like a soft mattress while some prefer a firm one but I will definitely review the condition and replace if necessary. May has been exceptionally wet in Florida this year and I apologise if the windows were not as clean as they should be.